These century-old war machines have now become monuments to the events of their time. Last of their kind, they are still here to tell the fateful tales of the men who fought in this horrific battle called «The Great War». «Gentlemen, the victory in this war will belong to whichever of the two belligerents is the first to succeed in placing a 75-mm gun on a vehicle able to be driven on all-terrain». A hundred years ago, the French army used tanks in battle for the very first time. 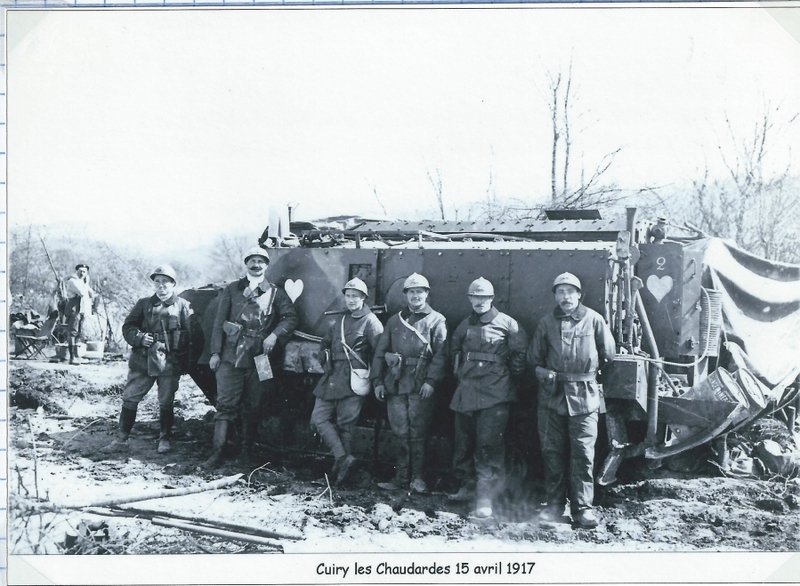 On 16 April 1917, 132 tanks stationed just north of Berry-au-Bac took part in an offensive. The Schneider tanks were divided into two groups: the BOSSUT group and the CHAUBES group. And the Saint-Chamond tanks were into the LEFEBVRE group. The tanks in question were 13-tonne armoured tanks, each fitted with a 75-mm gun and a couple of Hotchkiss machine guns. They had a crew of seven. The endeavour – the first time tanks were used in battle – was not exactly a huge success. Practically half of the tanks were put out of commission: they were either destroyed by German artillery, or they broke down. The leader of the BOSSUT squadron, who was in command of this first group of tanks, was killed on the first day of the offensive. This tragedy resulted in a great deal of thought about how this new technology could be used.The tank was to become a decisive weapon in the world’s ensuing major battles. The first Schneider and Saint-Chamond armoured vehicles joined the Great War in April and May 1917. For the crew, it was a hellish experience. They were scarcely able to stand up and had to think against the noise of combat and the burning heat generated by the enormous engine. The air they breathed was full of gas and fumes released by the cannon blasts and the machine-gun volleys. The battlefields were oceans of mud, strewn with shell holes, obstacles and trenches. The Schneider and Saint-Chamond armoured vehicles quickly revealed their weaknesses in their first few battles. They were too slow, and once they were stuck in the mud, they were very vulnerable – an ideal target for German artillery. Used intensively, these breathless veterans were replaced in 1918 by the world’s first ever tank: the Renault FT-17. The Schneider was massive. 6.3 m long and 2.3 m high – it was a fortress on caterpillar tracks. Its 65 hp petrol engine struggled to shift the 14-tonne vehicle at 4 km/h. The Schneider’s main armament was a short 75 mm cannon on the right side (with a reserve of 90 shells) and two Hotchkiss machine guns projecting from the flanks. It had a crew of seven: a commanding officer, a driver and five men who manned the cannon and machine guns. Maintenance difficulties meant that the mechanics had to retrieve spare parts from tanks that had been put out of commission during combat. Its 160 L petrol tank gave the Schneider a practical range of about 50 km. Fuel consumption: 320 litres per 100 km. With its low, elongated profile, culminating in a bow, the Saint-Chamond resembled a warship. One of the more curious features of this armoured vehicle which gave it an extremely contemporary feel was its hybrid motor. A huge petrol Panhard engine was coupled to a generator, which in turn was connected to two separate electric motors, one for each track. This configuration made it easier to operate the tank’s transmission system and its steering. But just like the Schneider, the Saint-Chamond had its weaknesses: its extremely heavy-duty armour plating made it too heavy… and so too slow. Its overhanging front and rear hulls made crossing uneven ground difficult. However, it boasted significant firepower: it featured the famous 75-mm field gun at the front, together with four Hotchkiss machine guns. This meant that it had little difficulty breaking through the fortifications of enemy campaigns. Fuel consumption: 400 litres per 100 km.